Helsinki is expanding, changing, growing, becoming more sophisticated, green, comfortable and exciting city to live, work, study and have family in. In the past few year the capital has changed more than in 100 years before that. And more transformations are coming to change the way the capital looks and lives. Among the biggest recent development projects announced or already underway in Helsinki are Jätkasaari, Kalasatama, Central Pasila, Viikki. These projects are taking place in different areas of Helsinki and unless we live or work there we don’t really see what is happening there. But we all travel to or through the downtown Helsinki once in a while and can observe first-hand the transformation it is undergoing. Even if you only in the center to catch a train you must have noticed how fast the urban landscape has changed over the last three years with all the new commercial buildings growing along the western side of the railways. They are a part of Finlandia Park project that is gradually taking shape to become a “living room” for the people of Helsinki. Helsinki central park and Finlandia Hall are undergoing a major transformation to become a cultural and recreational area in the Töölönlahti district. If you have been to Helsinki or lived here surely you have been in the Helsinki Central park or Hesperia Park along the bay of Töölönlahti. Have you ever thought this urban landscape is an unfinished project? Because that is exactly what it is – an urban development project that started over 50 years ago! In the end of 1950 Alvar Aalto was entrusted with the task of designing a central plan for Helsinki. The plan of the Helsinki’s Töölönlahti bay area development proposed building a terraced square with a variety of public buildings along the waterfront, partly on ground and partly on water, to allow an open view of the bay through the buildings. Back then only one of the buildings was completed the concert and conference house of Finlandia Hall. It was designed with the intention of preserving the surrounding landscape of Töölönlahti bay. Despite the intensive urban development in the city Center (Olympic Stadium complex, Linnanmäki amusement park, Finnish Museum of Natural History), the Park area was left untouched until in 1993 when a new Opera House was built. Building of Kiasma Museum of Contemporary Art in 1998 on the southernmost site of Töölönlahti became the next stage of the area development. When the City of Helsinki was offered land next to the central railway station by the former state rail yard, and the southern section of the site by the Parliament House, a new development plan was designed. And that’s when Finlandia Park project come into being. The idea was that he new development will grow from the present shorelines of the bay in the south to behind Finlandia Hall and further extending all the way to Kiasma. 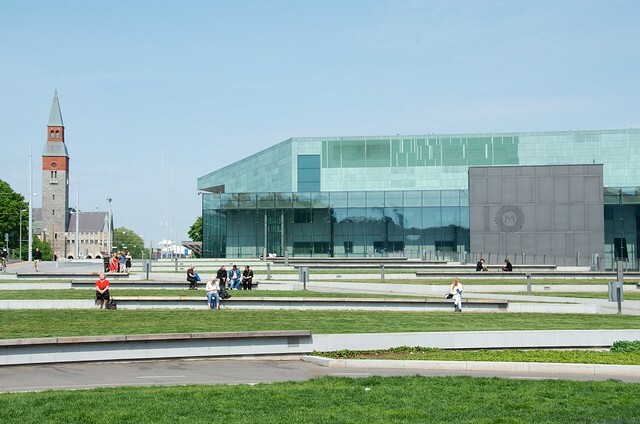 The new concert hall, Musiikiitalo , opened in 2011 across the Parliament House became the next urban art and cultural center between Kiasma and Finlandia Hall. Opposite Musiikkitalo , along the city’s Railway station tracks new residential and commercial blocks are being build acting as a wall between the city’s railway system and the proposed park. Most of the commercial buildings are now finished and house companies, cafes and restaurants. Do you see it now? How major art and cultural public centers of modern Helsinki are built along the the park’s shoreline, forming the central axis of the Finlandia Park plan. A dance pavilion and the new Helsinki Central Library are the next urban projects to be built in the area. In January 2014 project ‘Käännös’ by ALA Architects was announced as the winner of the Central Library architectural competition. The new library is an impressive building of glass and wood that looks like it is floating in the air. A traditional library, a spacious public space and a workspace to share and practice hobbies, learn new skills and organize events will come together in one building. There will be three floors, a balcony and … a sauna. 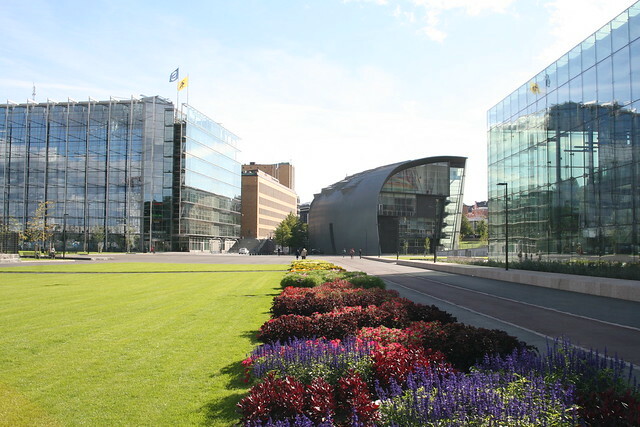 It is estimated that Helsinki Central Library will be ready to open its doors 2018. The library already has a website and there is a lot going on as people of Helsinki are excited about this new amazing project. Posted 5 years ago by Inessa.